Ebrahimi Saadatlou, M., Shahrouz, R. (2016). Histoanatomical study of the lens and ciliary body in ostrich eye. Veterinary Research Forum, 7(3), 221-226. Mohammad Ali Ebrahimi Saadatlou; Rasoul Shahrouz. "Histoanatomical study of the lens and ciliary body in ostrich eye". Veterinary Research Forum, 7, 3, 2016, 221-226. Ebrahimi Saadatlou, M., Shahrouz, R. (2016). 'Histoanatomical study of the lens and ciliary body in ostrich eye', Veterinary Research Forum, 7(3), pp. 221-226. Ebrahimi Saadatlou, M., Shahrouz, R. Histoanatomical study of the lens and ciliary body in ostrich eye. 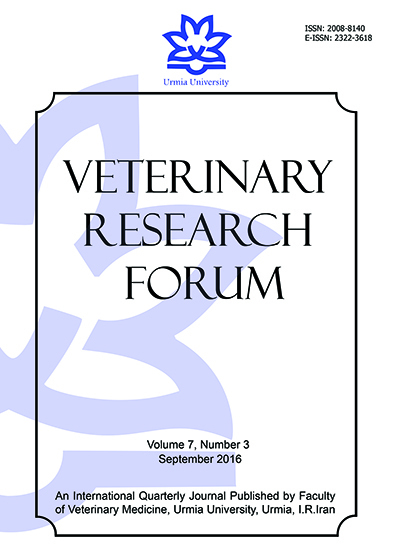 Veterinary Research Forum, 2016; 7(3): 221-226. In the present study, the lenses and ciliary bodies of 20 ostrich eyes were studied macroscopically and microscopically. The histological slides were studied after staining by hematoxylin and eosin, Verhoeff, Van Gieson, and periodic acid-Schiff (PAS). Posterior surface of lens was more convex than its anterior surface. The average lens diameter and thickness were respectively measured as 1.43 ± 0.00 and 0.85 ± 0.00 cm. The average ciliary body thickness was measured as 1.48 ± 0.01 cm. In addition, the ciliary body was seen annular with mean horizontal and vertical external diameters as 4.80 ± 0.07 and 4.36 ± 0.06 cm, respectively. The retina is extended on ciliary body in this bird. The number of ciliary body processes was about 120. The epithelium of lens was cuboidal and the lens capsule had intense positive PAS reaction. Also, the anterior surface of capsule was thicker than its posterior surface. The lens fibers in the central part were thicker than other parts. Elastic and collagen fibers were not observed in the lens. The epithelium of ciliary processes had two layers; superficial cuboidal non-pigmented layer, and deep heavily pigmented layer. The ciliary body was supported by a hyaline cartilage. In addition to the smooth muscle fibers, many isolated skeletal muscle fibers were also seen in ciliary body. In conclusion, the lens and ciliary body of ostrich were similar to other birds, although there were little differences in anatomical dimensions and histological characteristics. This work was proposed for determining the structure of the ciliary body and lens in eyes of the ostrich. The eye lens of the ostrich was less convex in the anterior surface than the posterior one. In other words, the lens was less strongly curved in its corneal surface than vitreal surface (Fig. 1). In the ostrich, lenses were crystal, transparent and rather soft. They were surrounded and supported by the ciliary body (Fig. 1). The average diameter of the lens was 1.43 ± 0.00 cm, and its average thickness (anterior-posterior) was 0.85 ± 0.00 cm. Fig. 1. Anatomical sections of the ostrich eye. 1: Lens, 2: Ciliary body, 3: Ciliary processes, 4: Retina, 5: Iris, 6: Pectin. Some areas of the ciliary body which were the part of choroid layer were covered with retina and observed as completely round and radially arranged folds inside of the eye ball. The retina in this animal was passed the ciliary body and reached up to the contact point of the ciliary body and the lens (Fig .1). The average width of ciliary body was measured as 1.48 ± 0.01 cm. Moreover, the ciliary body was round and its mean outer horizontal and vertical diameters were 4.80 ± 0.07 and 4.36 ± 0.06 cm, respectively. The average number of ciliary processes in the ostrich was almost 120. The lens surface was surrounded by a thin basophilic capsule. The anterior epithelium was observed under the capsule, with one layer of squamous cells. These cells had almost round nuclei surrounding with light cytoplasm. The lens fibers were seen parallel to each other with an acidophilic color (Fig. 2). Some of the fibers had dark color while others were light-colored. The epithelium was thinner at the posterior part of the lens. The lens fibers were seemed to be thick in the middle areas, but they were looked thin in the lateral parts. The elastic fibers were not observed in the lens following Verhoeff staining. The lens capsule showed positive PAS reaction, while the lens fibers didn't show this kind of reactions (Fig. 2). In Van Gieson staining, the accumulation of collagen fibers was not observed in the lens. The lens capsule was 32 µm thick anteriorly and 5 µm posteriorly. Fig. 2. A) Histological section of lens (H & E, 100×), B) Histological section of lens (PAS, 100×). 1: Capsule 2: Lens fibers. The ciliary body and the processes had numerous lined wrinkles and folds which were shorter at the back. The connective folds were covered by pigmented epithelium. This epithelium was double-layered on the folds (Fig. 3). The superficial layer was non-pigmented cuboidal. The cells were shorter at the top of the folds, but they were long at the bottom. Some of the cells looked like pear or pot, and the neighboring cells seemed to be separated from each other. The deep layer was composed of melanin-containing cells having nuclei mostly covered by melanin. Blood vessels with many red elliptical and nucleated erythrocytes were observed inside the folds (Fig. 3). The ciliary body as a part of the choroid layer was supported by a hyaline cartilage (Fig. 3). The main mass of the ciliary body was consisted of longitudinal smooth ciliary muscles as well as cross-sections of lymphatic and blood vessels. Skeletal muscular fibers were also seen in the form of separate masses in the ciliary body extended towards the ciliary process and the cornea (Fig. 3). Fig. 3. A) Histological section of ciliary body (H & E, 100×). B) Histological section of ciliary process (H & E, 400×). 1: Ciliary process, 2: Hyaline cartilage, 3: Skeletal muscle, 4: Double layer of epithelium, 5: Non-pigmented epithelium, 6: Pigmented epithelium, 7: Nucleated erythrocytes. Periodic acid-Schiff reactions were only observed focally in superficial parts of some non-pigmented epithelial cells of the ciliary body. Moreover, blood vessel walls showed positive PAS reactions. The collagen fibers were not seen clear enough, but they were clearly observed in perichondrium and cartilage (Fig. 4). The elastic fibers inside the connective tissue of the ciliary body were observed in dark colors towards the ciliary process (Fig. 4). Fig. 4. A) Histological section of the ciliary process (Verhoeff, 400×), B) Histological section of the ciliary body (Van Geison, 400×). 1: Non-pigmented epithelium, 2: Pigmented epithelium, 3: Elastic fibers, 4: Smooth muscles, 5: Nucleated erythrocytes, 6: Hyaline cartilage, 7: Collagen fibers. The ciliary body in the ostrich, which is the continuation of the choroid layer, in fact; is observed to be completely round and radially arranged folds inside the eye ball. In other words, some parts of the ciliary body are covered by retina. In other animals, the frontal limit of the retina is the starting point of the ciliary body, and it doesn't go beyond this limit.16 The mean width of the ciliary body in the ostrich was measured as 1.48 ± 0.01 cm. The mean width of the ciliary body in buffalo is 0.70 cm and the mean outer diameter of the ciliary body in buffalo is measured as 3.35 ± 0.70 cm.3 The number of ciliary processes in the ostrich is almost 120. In other animals, the number of such processes depends on the species and includes 70 to 100 ciliary processes. For example, 75 to 76 ciliary processes have been reported in the dog.16,17 The ciliary body and its processes provide a base on which lenticular zonules are attached. These zonules attach to the outer portions of the lens and hold it in place. The mentioned folds are connected to the lens by their fibers. The equinezonules are short and delicate at the beginning and become thick at the end.18 The thickness of the bovine ciliary body is variable, so, it has the greatest thickness in the posterior and lateral parts. The thickness of the ciliary body in cows ranges from 5.00 to 8.00 mm.13 The muscles of the ovine ciliary body have been reported to be very weak.11 In dogs, the ciliary processes have different lengths ranging from 0.10 to 2.40 mm.18 The width of the ciliary body and the number of ciliary processes in the ostrich were increased compared to other animals. Generally, it can be concluded that apart from the differences in dimensions and minor differences in terms of microscopy, the lens and the ciliary body in the ostrich are similar to other birds and different from mammals. This study was granted by research deputy of Islamic Azad University, Tabriz branch. Murphy CJ, Glasser A, Howland HC. The anatomy of the ciliary region of the chicken eye. Invest Ophthalmol Vis Sci 1995; 36(5): 889-896. Oliver FJ, Samuelson DE, Brooks PA, et al. 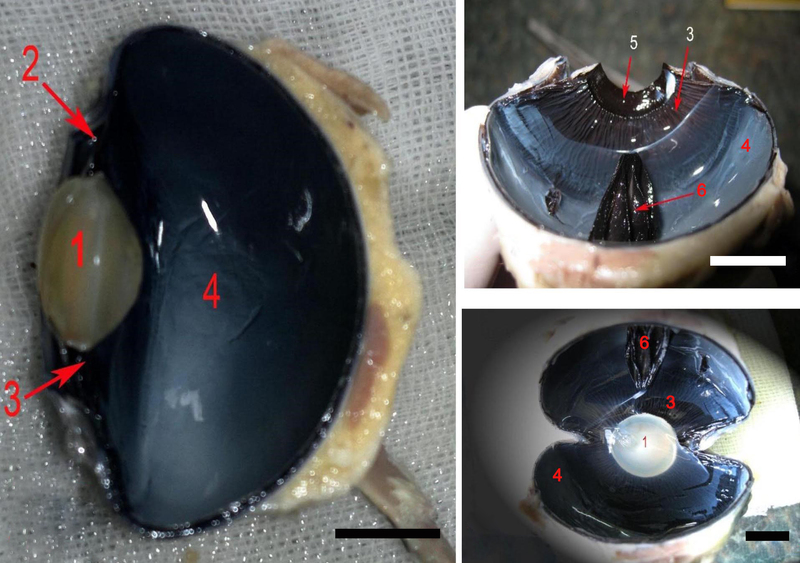 Comparative morphology of the tapetum lucidum (among selected species). Vet Ophthalmol 2004; 7(1): 11-22. Kassab A, Aoyama M, Sugita S. The morphology of the iridocorneal angle of buffaloes (Bos bubalis), alight and scanning electron microscopic study. Okajimas Folia Anat Jpn 2001; 78(4): 145-152. Martin GR, Ashash U, Katzir G. Ostrich ocular optics. Brain Behav Evol 2001; 58(2): 115-120. Kiama SG, Maina JN, Bhattacharjee J, et al. The morphology of the pectin oculi of the ostrich, Struthio camelus. Ann Anat 2006; 188(6): 519-528. Kiladze AB. Structural organization of anterior corneal epithelium of the African ostrich eye. Morfologia 2013; 143(1): 32-36. Tedesco RC, Calabrese KS, Smith RL. Architecture of the ciliary muscle of Gallus domesticus. Anat Rec A Discov Mol Cell Evol Biol 2005; 284 (2): 544-549. Glasser A, Howland HC. In vitro changes in back vertex distance of chick and pigeon lens: Species differences and the effect of aging. Vision Res 1995; 35(13): 1813-1824. Nickel R, Schummer A, Seiferle E. Anatomy of the domestic birds. Berlin, Germany: Verlag Paul Parey 1977: 148-151. Suburo AM, Marcantoni M. The structural basis of ocular accommodation in the chick. Rev Can Biol Exp 1983; 42(2): 131-137. Eurell JA, Frappier BL, Dellmann's textbook of veterinary histology. 6th ed. Hoboken, USA; Blackwell publishing 2006; 350-363. Junqueira LC, Carneiro J, Kelly R. Basic histology. 9th ed. 2013; 448-464. Getty R. Sissen and Grossman's anatomy of the domestic animals. 5th ed. 1975; 1741-1768. Lluch S, Ventura J, Lopez-Fuster MJ. Eye morphology in some wild rodents. Anat Histol Embryol 2008; 37(1): 41-51. Choh V, Sivak JG, Irving EL, et al. Ultrasound bio-microscopy of the anterior segment of the enucleated chicken eye during accommodation. Ophthal Physiol Opt 2002; 22(5): 401-408. Dyce KM, Sae WO, Wensing CYG. Textbook of veterinary anatomy. Philadelphia, USA: Saunders 2010; P: 323-336. Samuelson DA. Textbook of veterinary histology. Philadelphia, USA: Saunders Elsevier 2007; 487-512. Banks W. Applied veterinary histology. 3rd ed. Maryland Heights, USA: Mosby 1993; 371-389. Eleanor A, Blakely M, Kathleen A, et al. Growth and differentiation of human lens epithelial cells in vitro on matrix. Invest Ophthalmol Vis Sci 2000; 41(12):3898-3907. Pardue MT, Sivak JG. The functional anatomy of the ciliary muscle in four avian species. Brain Behav Evol 1997; 49(6):295-303. Murphy CJ, Dubielzing RR. The gross and microscopic structure of the golden eagle (Aquila chrysaetos) eye. Prog Vet comp Ophthalmol 1993; 3: 74-79. Monfared AL, Bakhteyari Z. Some gross anatomical features on ostriches' eye and its application for clinical treatment of ocular abnormalities. Glob Vet 2013; 11(1): 76-79.